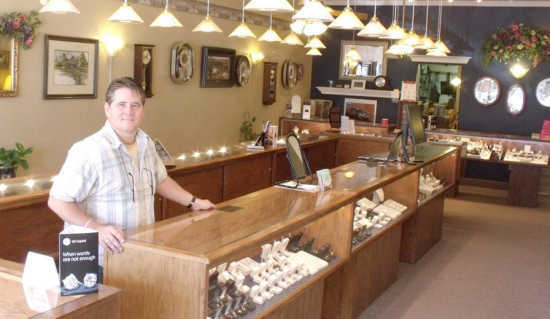 Bill Longnecker sells a wide array of jewelry, watches and clocks in his store at 314 Norris Avenue. Longnecker is also an accomplished jewelry designer. When Bill Longnecker was a young boy, he remembers being fascinated as he watched Bill Schilz at work in his McCook jewelry store. However, it was not until years later that Longnecker realized the jewelry business was what he wanted to do as his life's work. The turning point came in Kansas City in the early 1990s. After graduating from Republican Valley High School and spending four years in the U.S. Army, Bill entered the retail business, eventually ending up in Kansas City, Mo. It was there that he began as a jewelry salesman and later became associated with an independent jewelry designer, Larry Lee. From that point forward, Longnecker's life has been spent in the jewelry profession, first as a designer for Lee's independent business, and later as the head jeweler for Jimmy Smith Jewelers in Decatur, Alabama. It was at this point that Bill realized that he was too far from home, and wanted to come back to Southwest Nebraska. "I was born in Maywood, went to grade school in McCook and graduated from Republican Valley High School," Bill said. The opportunity to come home came a few months later when Bill became associated with Johnson Jewelers in McCook. Soon, a desire to own his own store led Bill to establish Longnecker Jewelry in Imperial. From that beginning in 1996, Bill has moved and expanded, establishing Longnecker Jewelry at 224 Norris in McCook in 1999, and moving to larger quarters after purchasing the building at 314 Norris Avenue in 2004. The 314 Norris store -- which has been Longnecker Jewelry's home for the past nine years -- brought Bill's jewelry career in Southwest Nebraska full circle, as that is where Johnson Jewelers was located when Bill began working for the Johnson family in the mid-1990s. "I am very fortunate," Bill said. "I'm doing what I love to do in the place I want to be." What originally attracted Longnecker to the jewelry business was the opportunity to do design work. "I have always liked art and my favorite part is sculpting, which I get to do through jewelry design work," he said. Advances through the years now allow Bill to craft engagement rings and other jewelry items with computer-aided design. "There are great advantages to the computer-aided designs," Bill said. "Now, we can craft precisely what jewelry customers want, and the cost is less because of the time we save from the days when we did artistic sketches before wax sculpting." The Longnecker Jewelry store at 314 Norris -- distinctive because of the bright blue awning and window tops -- is open from 10 a.m. to 5:30 p.m. Tuesday through Saturday. Inside, a wide array of jewelry, watches and clocks await the flow of customers on McCook's increasingly busy main business street. Thanks to Sehnert's Bakery and the Bieroc Cafe, located next door, and El Puerto restaurant, across the street, parking spaces in the 300 block of Norris are often filled. "The activity is good for business," Bill said. "McCook is fortunate to have a dynamic downtown shopping district." Whatever the need in the jewelry line, it is available at Longnecker's. "Name it and we have it or can design it precisely to your needs," Bill said. This includes the store's leading seller, engagement and wedding rings. The long list of jewelry items also includes necklaces, earrings, bracelets, pendants, mother's rings, family rings, solitary diamonds, gemstone rings and anniversary rings. Adding to the list are the two other very popular lines: watches and clocks. In the watch department, the spotlight at Longnecker Jewelry is on the Citizen brand, which now features echo drive. Drawing power from any light source, the Citizen watches do not require batteries and maintain precise timing. "Citizen watches have proven so popular and reliable that they have been our main watch line for the past three years," Bill said. Clocks are also a major attraction at Longnecker Jewelry. Wall and mantle clocks made by Seiko come in a range of shapes, sizes and designs. An added enhancement for clock purchasers are "Melodies in Motion" musical clocks, which feature soothing tunes and smoothly moving parts. In addition to the jewelry, watch and clock offerings, Longnecker Jewelry has become a popular ordering site for gift items. "We offer a large assortment of gift items for weddings and other special occasions," Bill said. "There are a vast number of choices, which we can order and assure delivery in a very short amount of time." Janelle Williams, left, handles customer service, bookkeeping, and office duties at the store. Mandy King , right, is a part-time summer employee. Ably assisting Bill in the jewelry store is Janelle Williams, who specializes in customer service and handles bookkeeping and office duties. In the summer, Bill and Janelle are aided on a part-time basis by Mandy King. "Come see us," the Longnecker team said. "We are conveniently located on the bricks in downtown McCook and we have a wide range of jewelry items for your shopping consideration. And, if you have special requests, we can design items to your exact specifications." For more information about Longnecker Jewelry, visit their web site at www.longneckerjewelry.com. Bill is a nice guy who will do a nice job.